A few months ago after a clinic session in a hospital in Las Pinas, I walked to my car which was parked in the lot that the hospital shared with an aviation school. And guess what…on that day they were taping scenes for the now defunct soap opera, Dahil May Isang Ikaw. 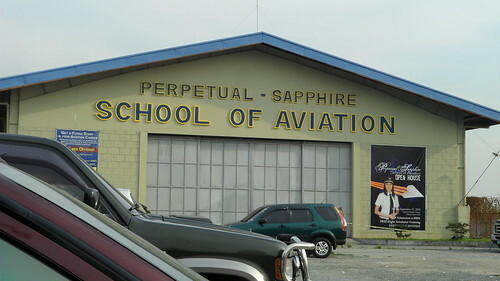 The school was used as the set for the aviation school that the character played by Coco Martin was supposed to be studying at. So every now and then, when I go to the clinic, it makes me smile when I see it. About a month ago, when I went, I saw a sign for an Open House the school is holding that allows potential students to check out what the school is about. They even offer simulation exercises, as I understand. I don’t know, however, what else the open house would allow, such as whether or not guests can do mechanical exercises or compare radar detectors or what not. Oh…just to share…today when I went to the clinic, the doors were open (errr….literally! haha) and I saw a plane inside but I had no camera!!! Gaaah! This entry was posted on Saturday, February 26th, 2011 at 7:01 pm	and is filed under Education. You can follow any responses to this entry through the RSS 2.0 feed. You can leave a response, or trackback from your own site.